This partner activity is best used AFTER students have learned about how to find the Surface Area of a Rectangular Prism using the formula. Students use a number cube and practice placing numbers in the formula and solving. 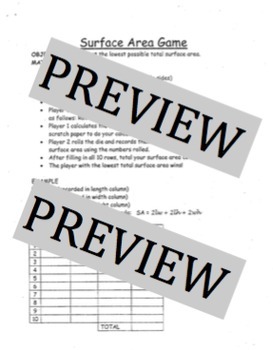 Instructions and game boards are included, just copy (front & back) & you are ready to go! Surface Area Game by Ebel in the Middle is licensed under a Creative Commons Attribution-NonCommercial-NoDerivatives 4.0 International License.